Reduced to its simplest form,the vascular system is a series of interconnected biologic conduits filled with fluid moving under pressure. This system is subject to injury and must repair itself in order to avoid exsanguination. This latter function is provided by the hemostatic system. Thus, normal hemostasis is a reparative process and consists of three major mechanisms: (1) vasospasm, which is the main mechanism for controlling bleeding after tran-section/avulsion injuries of large arteries, arterioles, and veins; (2) platelet plug formation; and (3) the procoagulant system. The procoagulant system consists of the mechanisms by which fluid blood is converted into an insoluble hemostatic thrombus. While inherited or acquired disorders of all three mechanisms can cause clinically abnormal bleeding, this chapter reviews the molecular basis of inherited disorders of the procoagulant system (e.g., hemophilia A and B, von Willebrand disease). Inherited vascular and platelet disorders associated with abnormal bleeding are not discussed here. Consider also that, once activated, the reparative (e.g., hemostatic) response to injury must be constrained such that the thrombus is limited to the site of injury, and must be downregulated such that the conversion of fluid blood to solid thrombus does not propagate throughout the lumen of the vessel. This coagulation-limiting function is provided by the anticoagulant system. Inherited disorders of the anticoagulant system (e.g., familial thrombophilia) are associated with venous thromboembolism and complications of pregnancy. Although biologically plausible, the association between familial thrombophilia and arterial thrombosis is unproven and is not reviewed here. 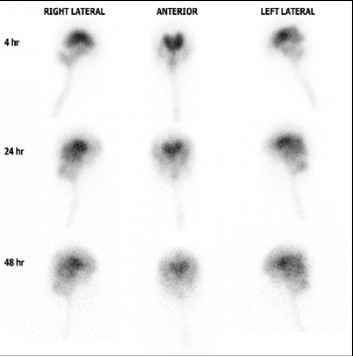 The initial reparative response to endothelial injury is platelet adhesion to the exposed subendothelial matrix. Platelets circulate preferentially along the vessel luminal surface, as opposed to circulating evenly distributed throughout the blood. Thus, platelets can be viewed as "surveillance" blood cells that are "searching" for sites of endothelial injury. Platelet adhesion at an injury site is mediated by the ligand von Willebrand factor (VWF).VWF tethers platelets to the site of injury by binding to collagen within the subendothelial matrix exposed by the injury, and to the constitutively active platelet receptor glycopro-tein (GP)-Ib-IX-V complex. Firm platelet adhesion at the injury site is mediated by subsequent binding of the platelet GP-a2Pi collagen receptor to subendothelial matrix collagen. VWF binding to platelet GP-Ib-IX-V generates transmembrane signals that activate platelets, converting the constitutively inactive platelet fibrinogen receptor GP-anbP3 (GP-IIb/IIIa) to the fibrinogen-binding conformation. Subsequent platelet-to-platelet cohesion is mediated by fibrinogen or VWF binding to platelet GP-anbp3. In addition, a scramblase within the platelet membrane phos-pholipid bilayer flips negatively charged phospholipids from the inside to the outside bilayer leaflet of the membrane. The negatively charged phospholipids support assembly of the plasma procoagulant factors on the external surface of the platelet membrane. Finally, the contents of the platelet dense granules (ADP, serotonin, etc.) and a-granules (fibrinogen,VWF, factors V [F5] and XI [F9],etc.) are released, which feed back to activate additional platelets and support the plasma procoagulant system. to form the "prothrombinase complex" that activates prothrombin (F2) to thrombin (F2a). The Factor X-ase and the prothrombinase complexes assemble on negatively charged phospholipids within the outer membrane of activated platelets. 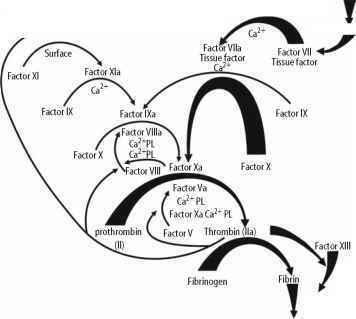 Thrombin produces a hemostatic thrombus by cleaving fibrinogen (F1) to form fibrin monomers, by activating platelets, and by activating factor XIII (F13) to factor Xllla (F13a), which cross-links strands of fibrin monomers to form an insoluble hemostatic thrombus. In a feedback amplification loop, thrombin also increases its own production by activating F5, F8, and factor XI (F11).